Husband and I switched up our Sunday evenings yesterday with a late evening/into the night trip to the drive-in movie theater. 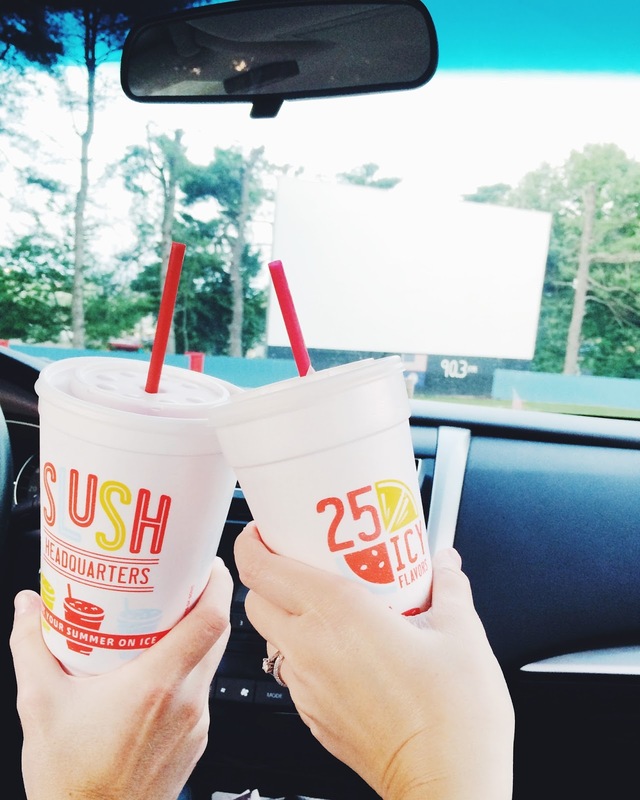 Because even with jobs picking back up on Monday, what else do you do with yourself on a summer night when cool breezes are blowing, slushes are calling your name, and an X-Men movie is playing? We made some popcorn (husband forgot to put the butter on it, but that's another healthy story), made a pit stop at Sonic, and brought along some candy. I, dressed in my sweatpants and an overly baggy shirt, packed a blanket and pillow to complete my cozy, comfortable vibe. And I'm glad I went simple and uncomplicated because I was so comfortable wrapped up in the front seat of the car for the entire movie. Really, where else can you drag along your pillow, blanket, and sweats to go see a movie (no, I'm not talking about your living room.)?? I loved the experience and the simplicity of watching a movie at the drive-in, on a Sunday night when there is little-to-no crowd. It was almost like we had the place to ourselves. Not to mention, we paid half of what we would have paid at an actual cinema to see the same exact movie, and I got to dress in sweatpants (have I mentioned that?). To pass by the wait time before the movie began, we played some Monopoly Deal (a card game favorite that you must try). I'd say it was the perfect way to end the weekend and get ourselves revved up for the work week. If you're in our area, I suggest stopping by the Starlite Drive-In because you won't be disappointed. I'm watching the list of movies coming out next so we can plan our next Sunday night date. Hope you had a pretty stellar weekend and have a happy Monday!